We’ve been networking since the Industrial Revolution made it possible for us to leave our hometowns and scatter across the country. Traditional meeting venues such as local Chambers of Commerce functions, service clubs and golf courses have always provided opportunities for members of the “boys club” to connect, but networking for mere mortals launched from an unlikely source. Jerry Rubin, of Chicago Seven fame during the 1968 Democratic National Convention, had a capitalist epiphany during the 1970s, and he became an entrepreneur. During the 1980s, the Yippie-turned-Yuppie found a way to turn a profit from Studio 54’s Wednesday-night dead time. As you view Jerry Rubin’s card, note the two draws—Studio 54 and “dancing.” First-timers came for the wall-to-wall action—to get a glimpse into the world of the glitterati that littered the notorious disco on the weekends. In the early days, it was a place to see and be seen, and to fill a calendar for the upcoming weekend. I went on a borrowed business card, and it was the closest I ever got to the “real” Studio 54. Once was enough. Thousands of people crammed onto a disco floor on the pretense of making business connections was not my idea of fun, and I had no need of networking at the time. Rubin was a sharp businessman, and the networker of all times. He created a database from the business cards required for admission. Those names helped him build a vast downline when he entered the world of network marketing. Thanks to Rubin’s vision, networking has evolved to become the lifeblood of businesses, entrepreneurs and solopreneurs. Further, it has evolved from contrived to organic. During the 1990s, bulletin boards, email lists and forums on Prodigy, AOL and CompuServe connected people with like interests. Lasting business contacts and friendships were formed because people joined groups that reflected their interests. Those who participated the most gained the most benefits. Today, nearly 250,000 Meetup groups bring together more than 25 million like-minded people, and LinkedIn is the meeting place of choice for more than 400 million businesspeople. Efficient networkers have learned to target their efforts by joining groups within LinkedIn—an update to the forums concept of the 1990s on a newer platform. 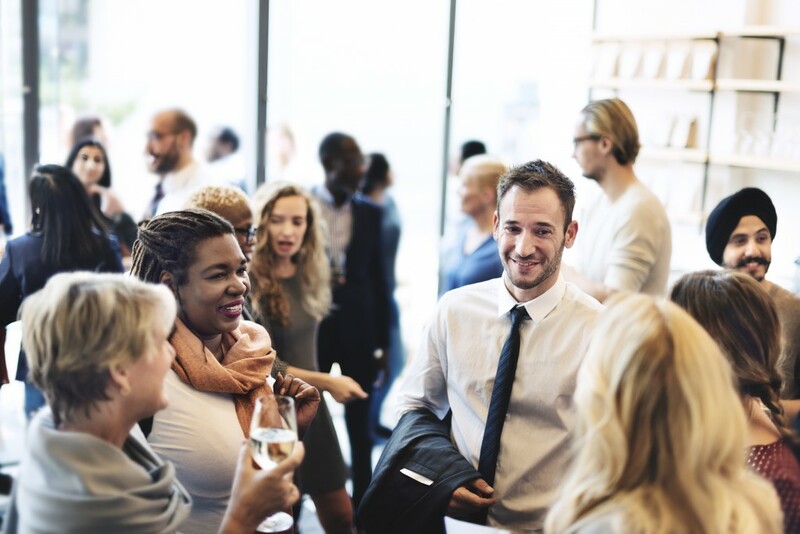 It’s important to hone your skills at networking events before attending company and industry conferences, tradeshows and conventions. The same holds true for educational seminars and workshops. You never know whom you might meet and what opportunities could cross your path at these extended events. It’s not rocket science to find a way to connect, but it’s an art form when practiced properly. To reap the greatest rewards, pay it forward. Give more than you receive. I’ve been on both ends of the spectrum, giving more than I received, and receiving more than I gave. Eventually, you reach an equilibrium. To build a solid network requires time and commitment. Your efforts will ebb and flow depending on your workload, and if you routinely bite off more than you can chew (guilty as charged), use the ebbs to reconnect and check in on your network. Begin networking at home: Reach out to people in other departments of your company to break the barriers erected by the silo mindset. You will begin to see things from other departments’ perspectives while you help to break down the “we versus they” mentality. You’ll enjoy a more congenial work environment and build your internal circle of influence. Make your first impression a good one: “Dress for success” is so 1980s, right? Wrong! Dress for the occasion, or you’ll make the wrong impression. Leave the sales pitch at home: Networking is a time to establish contact, not a time to sell your wares. Run, don’t walk from the person who launches into a pitch; more important, don’t you be the person people avoid. Use names: Use the personal touch by addressing someone by her name. Nothing scores points like using someone’s name, and it’ll help you to remember the name. Listen more than you speak: Make newcomers feel welcome by making the conversation about them. If you show an interest, they will want to learn more about you. Introduce newcomers: Take the time to make introductions for newcomers. It’s also a natural way to segue to another group. Take business cards: It’s not a contest to see how many cards you can pass out during the course of an event. We’ve all run into people who say, “Hello,” sling a card your way and then vanish into the crowd. You’re not running for mayor—unless you are, in which case you can disregard this tip. Diversify: Successful people develop broad networks. Build relationships: The operative word is “build.” Relationships aren’t built in a day, and they net more than just new business. Networking can lead to mentoring: Good mentoring is built on a foundation of solid relationships, which can grow out of networking. Sometimes mentoring is a two-way street where the mentor is also the mentee and vice versa. Acting as a mentor is a perfect example of paying it forward and doing for others. Employ The Godfather strategy: “Keep your friends close and your enemies closer.” Chinese General Sun Tzu, author of The Art of War, is credited with coining the expression long before it became popular in The Godfather 2. Of course, your competitors are not your enemies, but they can be your greatest allies, throwing business your way when they can’t handle it. Follow up: Send a follow-up email saying that it was a pleasure to meet him, and send occasional emails containing topics of interest. If you see a write-up announcing your contact’s promotion, send the link along with a quick congratulatory note—that kind of thing—but don’t be a pest. We live and do business in a connected world. You either reside inside the circle of connectivity or outside of it. Networking is a long-term strategy for expanding your circle and your perspective while shrinking the world around you. Start by showing up; but as with anything worthwhile, practice is the only thing that makes perfect if you want to harness the magic of networking. This entry was posted in Business, Small Business on April 26, 2016 by admin. Can “going green” build business profits?